In tribute to its six terrific seasons, Split Screens is sending off The Americans with not one but two special events at this year’s fest. Want to attend both events? Get access to both events for a special combo price of $20 ($15 for IFC Center members)! 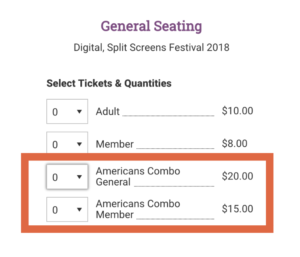 To take advantage of combo pricing, click on either event page (link above), then click “buy tickets” on either event page, click the start time, and then choose the combo price (general or member).